There's so much to love about this season's colorful array of trends—from puffy sleeves to the prettiest pastel pieces. Yet as much as we get a thrill out of talking about and shopping for the best trends of the season, there's a distinction between what we as Who What Wear editors write about on a daily basis and what actually finds its way into our closets. Trust us—it's hard not to wear every perfect piece we come across on a daily basis. So between losing it over the latest Zara shoes and testing out the lifespan of throwback trends, we're turning the lens around and showing you the combos that have quickly become our go-tos this spring. Ahead, see the outfit each editor is favoring right now and, of course, shop the look for yourself. 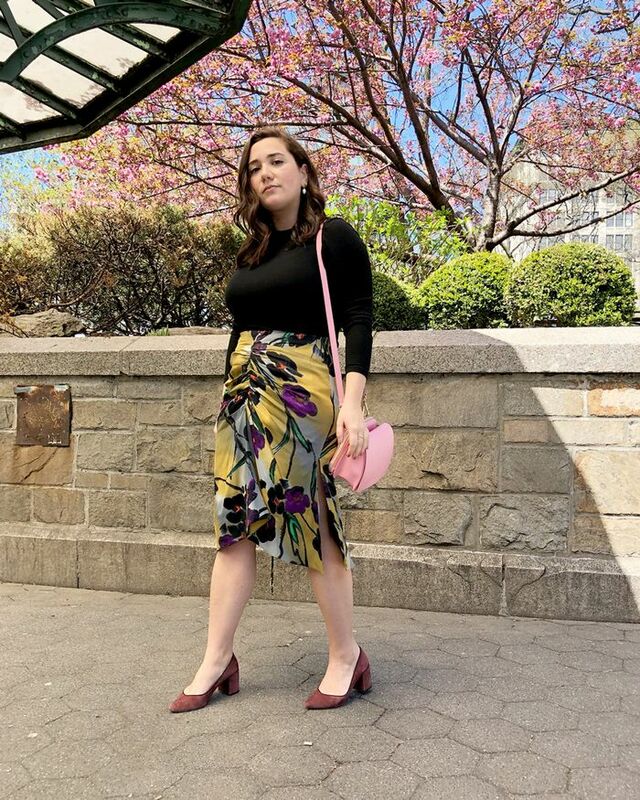 "I can be quite a creature of habit, and my spring go-to is usually a cool floral print paired with something super casual (like a classic tee) worn with heels comfortable to walk in (it's finally nice enough to do that!). It's not only a look that makes me feel good, but it can transform a bit based on how you style it, making it ideal for any day-to-night plans." "I love statement sleeves, and this super-cute T-shirt by Silvia Tcherassi is definitely my favorite interpretation of the trend right now. A silky A-line skirt and affordable flat sandals are two other things I'll be wearing over and over for spring. And of course, I can't forget my Casa Chiqui pom-pom bag." "I'm really into a loud top–and–simple jeans look right now—anything with a cool floral print or statement sleeve on top paired with my go-to Joan white(ish) jeans from J Brand. Also, a good selection of layered gold necklaces is an easy way to accessorize this spring." "I love wearing jeans from day to day, so every season I try to look for items that will make them feel more interesting and will make my outfits more on-trend. For spring, I'm loving this perfectly of-the-moment lilac sweatshirt, these comfortable Gucci slides that still give me some height, and a light bag to make everything feel just a hint more seasonally appropriate. Also, sunglasses—always." "It's finally warm enough to unpack the colorful dresses I've had stuffed in the back of my closet for the last six months. My go-to look is to style them with sneakers: unfussy and comfortable." "Right now I am loving cargo-inspired pants in light colors like white or tan. I find that pairing them with a frilly blouse or in this case a smocked crop top contrasts the heavier pant style and creates a forward look for spring. Beyond the fact that crop tops plus high-rise pants are my normal go to, this version feels particularly fresh and makes me feel at home in my outfit." I usually want to wear the opposite of sweaters, jeans, and ankle boots by the time spring arrives, so pretty dresses and espadrilles it is (for now). Available in sixes 35 to 40. "I don't think I've ever worn green before this month, but now it's one of my favorite colors. This Réalisation Par dress is easily one of my best new purchases because I love the shade, as well as its super-flattering shape. Just add a Staud bag and you have my go-to outfit for the season." "I'm always balancing contrasting styles in my outfits, so to pull off these workwear-inspired cargo pants, a delicate corset top was in order. I finished it off with these (incredibly affordable) PVC slides that have quickly become the only pair of shoes I'm wearing this spring—they go with everything." Now see which jewelry staples Who What Wear editors wear on repeat.